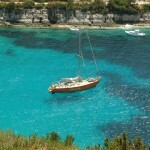 I plan leave this afternoon and sail during the night arriving by day light on the Italian coast. It is about a 100 mile trip. I hiked up totn he cemetery at the St. Nicholas Church. I had told my daughters that I wanted to be buried in the cemetery at Sea View, just North of La Conner overlooking the San Juan Islands. I changed my mind instead of looking at the Anacortes refinery I want to be buried here. Better view yet. I found more Petric and Dorotic names in this cemetery. 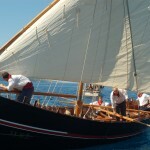 On the way back to the boat I ran in to Antica Dorotic(h) from Cleveland, Ohio. Turns out her father Tonze D. is a cousin of Tony Blazevich a fisherman from Bellingham, wo I have met years ago and is a friend of my best friends in Bellingham. 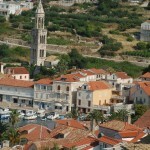 Antica’s sister is married to a Petric from this island. I am looking forward to my sail around Italy but a little sad in leaving this beautiful part of the Adriatic and its connections to the North West. 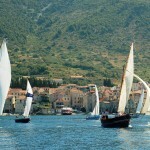 Friday evening June 29 back at Komiza on Vis. I spent a couple more hours early this morning in Split. And then headed back for Komiza, where I was the previous weekend, participating in the annual regatta of the Sardine race to Palagruza. 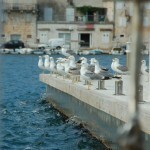 I plan to clear out of Croatia here, tomorrow or Sunday morning and head for the Italian east coast. The two weeks I spent in Croatia will for ever remain highlights in my voyage. 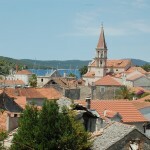 Particularly the short visit I made to Sumartin, on the island of Brac, where many of the Puget Sound Croatian pioneers have their roots. 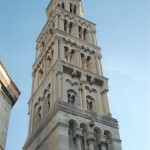 The Split Cathedral of Saint Domnius is unique. Photographs are not allowed in the cathedral. It is one of the oldest churches in Europe. Built on the foundations of a Roman Palace/Mausoleum of the third century. The Aya Sophia in Istanbul is from the same era but of a higher pedigree. I am back on the main land, the Dalmatian coast. 43 degrees North. That is about as far north as I will be for the next month or so. 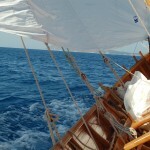 From here I plan to sail back to Vis and then cross to Italy and follow the east coast of Italy and around Sicily. I might make a stop in Tunis. Split is an amazing city. A mixture of baroque from the Austro-Hungarian rule, remnants of the Venetian, Greek and Roman colonization. The cathedral is remodeled from the mausoleum of the Roman emperor Diocletianus, third century. I am anchored out. Hopefully I’ll get a more restful night this way. 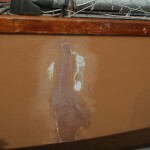 Last nigth the swell jerked the boat violently on it’s mooring lines. I had coffee with the two Skansi cousins, Tom(islan) and Srdjan. Tom is a retired surgeon and lives in Virginia Beach. He has a very nice home here in Sumartin as well. 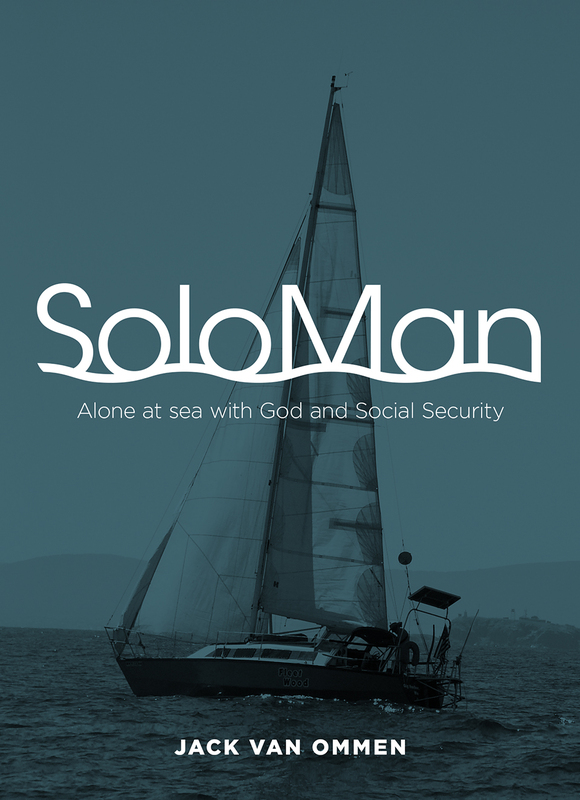 Several years ago he sailed his catamaran from Virginia to Sumartin and back. Srdjan worked as a bridge officer on tankers and later on supply vessels for the oil platforms, all over the globe. They are related but from two different Skansi clans in thjis town. Tom is of the Mala Banda (short side of the harbor) and Srdjan from the Vella Banda (Long side). About 3 generations up from the two cousins a “short” and a “long” Skansi married each other. This practically guaranteed that most of the Sumartin Skansis are related. (The Gig Harbor Skansis changed their name to Skansie). Next I poked around in the boat yard. 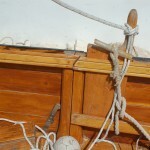 There are no new boats built any longer, just maintenance and repairs. Then I paid my respects to the padre of the St. Martin church. I could have spent more time with him. Great guy and very willing to help any one in finding their ancestry in Sumartin. 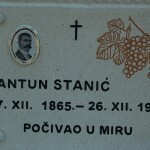 There are church records and he has access to a detailed work on many of the Sumartin families written in Croatian and Italian. 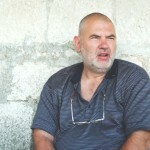 Srdjan Skansi volunteers to be the email relay for anyone inquiring to father Miro Ancic, ofm. 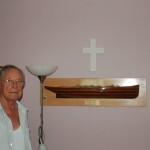 Father Miro served the Croatian community years in Vancouver and outlying areas for 8 years. He told me how he had trouble crossing the border into the US, they suspected him to be a muslim terrorist. When you look at the below picture, you’ll have to give the border guys some slack, he does not look like a regular kind of man of the cloth. We sat under the grape vines, shared a Grappa and his experiences as a missionary in the Congo and on leaving he plucked a bunch of ripe figs for me. I figure that the people in Vancouver hated to see him go. I have a lot more notes to go through. I plan to work up something to be published in TNT and/or Gateway. 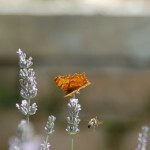 In Srdjan’s garden. Anyone know the Butterfly’s name? This is most likely the last stop on the Croation Islands. And it turned out to be the town with the most connections to Gig Harbor and Tacoma than any of the previous places visited. I am sitting here using the wireless internet of Srdzan Skansi. He is a direct relative of the Gig Harbor/Tacoma Skansie families. Yesterday I came across quite a few Vlahoviches in the cemetery in the town of Milna. I mailed one of the Vlahovich tomb pictures to John Vlahovich in Tacoma. I knew John and Mary casually when I was a member of the Tacoma Lawn and Tennis Club from 1973 till I moved to Gig Harbor in 1984. John wrote me back right a way and told me that his roots are in this village. 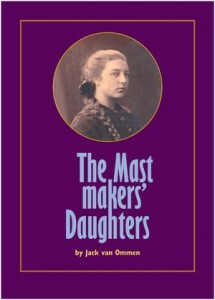 I met his uncle and aunt Velko and Nikolina Kazolin who remodeled the home John’s mother was born in. Right across from where his father lived. 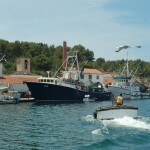 John’s grandfather Simon Kazolin designed and built the very first Dalmatian seiner fishing vessel here in Sumartin in 1928. See below picture of the scale model. I had a terrific sail here. I followed the southern coast line of Brac and some very strong gusts were coming down from the hills. 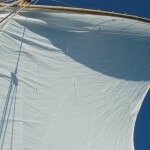 I was doing over 6 knots hard on the wind with two reefs and the 90 % jib. I may need to get a job if I stay much longer in Croatia. And it seems the closer I get to the mainland and the farther north the moorage price keep getting higher. Today I paid nearly $60 ( 346 Kuna), yesterday about $ 52.00 just a little further from town. 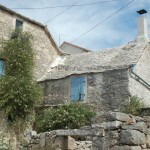 In Hvar City, which has ten times more to offer than this town I paid 180 Kuna, nearly half….. They had no showers, big deal. I have my H2O “Douche”. In Stari Grad I paid 120 Kuna. But at least I got the repair job done. I needed to put one more patch of filler on, but it cured to sanding firmness from morning to evening. See below pictures. “Fleetwood” is as good as new again. 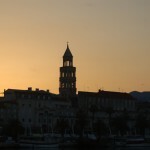 I am off to Split on the mainland in the morning. My 15 day transit permit expires on Sunday. 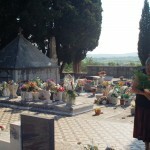 I had very much wanted to go see the brother of Zdenka Wydra in Crikvenica. But unfortunately I did not get sufficient address information when I saw Zdenka on her 97th birthday last January in Tacoma. My requests to her only relative, her granddaughter and her caregiver in Tacoma go unanswered. Unless I hear from them I will cross over to Italy from Split. Today I did my now routine visit to the cemetery. Again it is the prime real estate with the best view of the town. I found several Tacoma and Gig Harbor names, Martinich, Vlahovich, Jerkovich. Skansie is also supposed to be from Brac but from the other, east, end. There are hardly any owner operated yachts here, 90% charters. No French, No Dutch, just Austrians and lots of Norwegians Croats and a few Swedes and Germans. 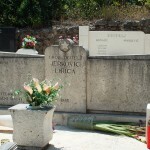 Jerkovich in Milna, Brac. A Gig Harbor name. These guys have been following me since I left Gig Harbor in 2005. No passports no language problems. Before, sort of looks like a religious picture. Hang on to it for my canonization process. 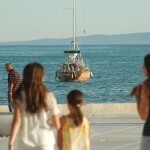 Monday June 25 Milna, Brac island. Yesterday evening in Hvar the town was filled with day and one night tourist visitors who come in from the nearby mainland on the frequent ferry schedules. A steady queue of tourists with back packs or pulling their luggage on rollers passed my moorage in both directions from the ferry dock into the old town. Many sat and watched the Europa Cup 1/4 finals, nearly all the sidewalk cafes had large screen t/v’s mounted for the event. At around 5.30 this morning, after the sun came up, my neighbors’ college age crew called it quits. I shall get more sleep tonight. 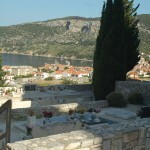 I got some groceries in Hvar and climbed up to the cemetery. I found another Petrich grave and I also found two familiar Gig Harbor family names, Stanich and Babich. But I cannot be sure that they are related. I took pictures and will try figure it out. I saw a lot of Novak graves. Never knew it is Croatian name. Looked it up, it is the 5th most common last name in Croatia. In Poland it is Nowak. Milna is also a very old settlement. It is too bad that the entire inner harbor is taken up with marina berths. This is the first harbor where I have seen purse seiners very similar to the ones on the West Coast of the USA. The boat building yard was recently closed here. I am moored in a newer marina a 5 minute bicycle ride from the town center but a stiff walk. I used my folding bike. 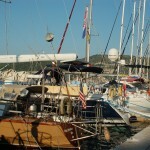 I am going to move to the town marina they have one very low dock where I can go along side and sand off the rest of the hull repair I did ten days ago in Bar, Montenegro. So, I’ll be here two days. The Martinolich family and Skansie came from this island but my first inquiries look like they are most likely at the East end, where there is still ship building done. I am on the West end of the largest island in the Adriatic. There was little wind today. We may get thunderstorms tonight. 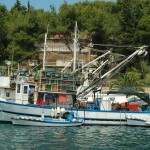 Seiners in Milna, just like ours in Pacific N.W. 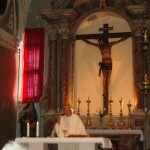 I went to 9 a.m. mass at the church of St.Peter the Martyr in the old Dominican Cloister. The choir was all male and they sung in harmony, the hymns were all of a similar style like Gregorian but more melodious. Just like in Polynesia it was a little unpolished but from the soul. The men in the congregation also dominated the singing. The envy of my St. Nicholas parish music director. I got my money’s worth for my collection portion, just from the singing. It reminded me of French Polynesia except their women were not singing the melody. A beautiful organ. The church was first built in 1453. It has seen and withstood many waves of occupations and colonizations. I had a chance, before mass, to go up to the cemetery and discovered a Petrich section, relatives of the Tacoma Petriches. I want to die on Hvar and be buried in this peaceful setting. 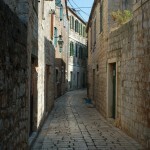 It took 4 hours to back track to Hvar City. But I am glad I saw both places. I went from door to door asking where I could find the cousin of Clare Petrich. 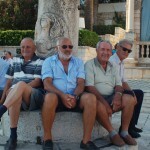 When it cooled off the wise and old came out and I found the group of men, each of the towns like Hvar has these gatherings, in their late seventies and older. Zorko Mauricic gave me the bad news that Clare’s cousin passed away last winter. Zorko knew Martin Petrich, the boat builder in Tacoma. Tony Busolich a local native who lived most of his live in Cairns, Australia , was my translator. I am squeezed like a sardine in a can between my two dock neighbors, the Harbor Master ghets his money’s worth. But most of the boats had to anchor out. 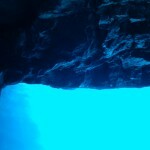 This is a very popular day trip tourist attraction from the mainland. I waited around for the start of the race to Palagruza. The local harmony band came to liven up the event. Long speeches and a beautiful poem/prayer was recited, which used to be prayed on this event. I could understand most of it because it was filled with Latin/Italian. 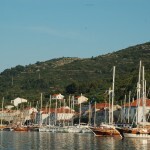 Vis was colonized for many years by the Venetians. There was not much wind. I was lucky yesterday. 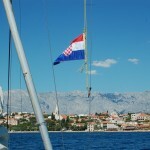 But it filled in later and I had a great sail down wind from Vis to Stari Grad. The sailors/fishermen are allowed to use their oars during the start and the race. 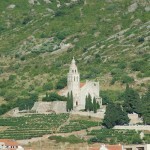 Stari Grad is the home of the Tacoman Petrich family. I hope to make contact with some of the relatives here. I am moored right on the town waterfront. There are a few places, that till now I can still count on my ten fingers, where I felt this feeling of total peace and harmony. Where I felt like I was intruding on sacred grounds. Where there was no disturbing noise, where everything was in place and in harmony with the environment. A small farm community south of Puerto Vallarta, Mexico in the late seventies, a fishing village on the East Coast of Malaya in 1962, several places in the Marquesas in 2005 and yesterday on my walk on the island of Bisevo and this afternoon walking on the edge of Stari Grad. 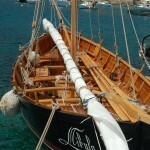 I plan to add a slide show just about these Gajeta Falkusa lateen rigged fishing boats to my web page on Traditional Sailing, item 98), on my index. With more pictures and text than I am showing today and yesterday. It was short hop around the other side of the small island. 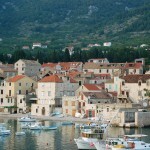 Komiza is a gorgeous old fishing maritime village. Of the three family names given to me by Leslie, my long time Bellingham friend, only one is known here and it turns out there are many of them. I met one last night but he had no relatives in America. So, I’m not catching fish on Vis. 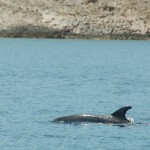 (the Dutch translation for fish is vis and in Viska Luka bay there is a settlement called Kut which is a much used Dutch slang word for the female organ, imagine a Dutchman living on Vis in Kut…..). I need to keep this short because I’m off for a sail on a lateen rigged traditional local fishing boat. There will be a regatta from here to Palagruza, tomorrow, the re-enactment of the annual race to the sardine fishing grounds. 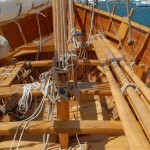 Take note of how these boats were built, the shear of the top sides is removable so that the boat can be rowed. It’s a little bit like Lego set. Incredible ingenious fine wood work, without fasteners. My neighbors are Patrick and Martine from Belgium and live very close to the village I lived in between 1966-1970. When I sang Jacques Brel: “Ca sent la biere de Londres a Berlin” they passed me an ice cold beer from their regfrigerator. Ca sentait bien! 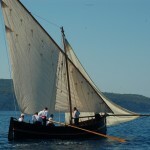 The sail went across to the island of Bisevo. There was plenty of wind. I am getting somewhere with the Bellingham connection. The helmsmen, Joe Dubra, in the picture, has an uncle in Bellingham. I expect to get the names tomorrow. There is also an ex B’hammer who is building a home in a nearby village, Joe Bozanich. The crew sailed the “falkusa” back and I then played real tourist for the rest of the afternoon. I t boat ride through the blue cave and then returned on the tour launch to Komiza, which included a 4 hour stop in an idylic bay on the other side of the island. I went for a nice hike to a high look out to take the below pictures and then for a swim. 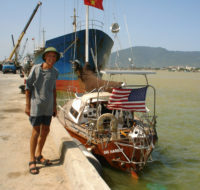 The red boat in the bay picture is “Helias” which happens to belong to Costa a sculpturer and art restorer. 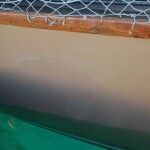 One of his crew members took a picture of the “falkusa” I sailed on and we will do an exchange. 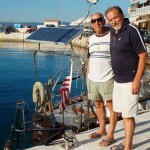 Costa and crew met up with his friend Jakša Fiamengo who lives here and is a well known author and poet. My new neighbors are a family from Zagreb, with son and his girl friend and their niece. They invited me aboard for a wonderful pasta dinner. Wednesday June 20 on Vis. 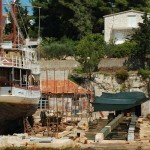 I left the island of Mljet yesterday morning. The leads for trying to meet up with relatives of one Gig Harbor fasmily from the island were just too vague. I decided to move on to the island of Vis. This was too far to sail during daylight. 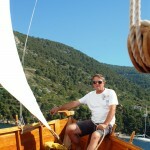 I anchored last night in a bay near Brna on the island of Korcula. I had some decent sailing. And a good nigth sleep at anchor. I am not sure if I wrote this on the previous blog but i ended up paying $ 50 for my dinner on Monday night in Polace. That was supposed to be the free moorage, for a dinner. The Croations have this great skill in advertising their menus and when you get the bill, there is a charge for the tableware, tips mot included and the 24% or so sales tax. Well I had been forewarned. ..Last night I paid 112 ( about $ 20) Kuna for anchoring. Here in Vis at the quay it is 320 Kuna, about $45, for my boat. 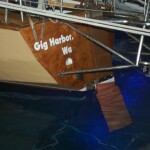 I could have saved some money by putting the anchor down and blowing up the dinghy but I wanted to show my transom with the Gig harbor hailing port to the locals, hoping to catch some one whose family had moved to Gig Harbor. After checking in here with the old men of the town it looks like the Bellingham fishermen did not come from this main town but from Komice, on the other side of the island, so that is tomorrow’s destination. I had some excellent sailing again today and then a little of the entire gamut the wind dealt me. Most of the visiting boats are charter boats. I think that out of the about hundred boat I and five more are privately owned.